Looking at the records for the season makes you feel that this game will be a foregone conclusion. Real Madrid come into this match with a 6-2 record while the Russians are on the road and they have a 2-6 record. This could be a night where Madrid run away with the game but if Kazan starts well and frustrates the fans and home players, it could be a slightly tougher match than expected for the Spanis sides. Sergio Llull has been in fantastic form for the hosts. His average of 20.1 points per game sees him lying third in the overall rankings and has pushed Madrid into third in the overall scoring table, with an average of 91.1 points per game. Madrid will be flying into this game after their demolition of Barcelona in Catalonia last week and you can expect the team from the Spanish capital to start strongly. They have defensive weaknesses which can be attacked but if Real get into a rhythm, they are very hard to stop, as their 6-2 record indicates. It is surprising that Kazan have performed so poorly this season while they have the top scorer in the league. Keith Langford is averaging 24.3 points per game and he has been in scintillating form so far this Euroleague season. Of course, while Llull has a backup army of support in Madrid, Langford is doing it all by himself, or so it seems, in Kazan. The Russian side has an overall scoring record of 79.3 points per game which sees them lying 13th in the rankings. It is up to the rest of the Kazan players to get around Langford and provide him with support and assistance. 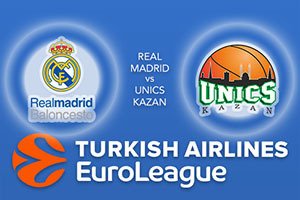 It is likely to be a tough night for UNICS Kazan but they know what it takes to win games if they can pull it all together. The bookies think the hosts will stroll this game and it is hard to argue with this logic. You should take Real Madrid at -12.5, which is provided at odds of 1.90. Anyone looking for the Over/Under market should choose to go UNDER 171.5 which is on offer at odds of 1.90. Bet Now!